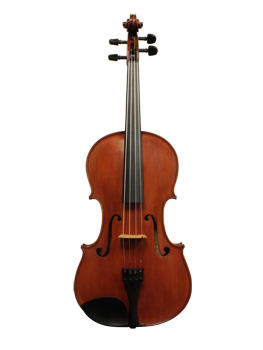 A beautiful, handmade, hand varnished viola made in Beijing, China. The neck and peg box are violin style to be lighter and narrower for easy handling. Tone is clear, ringing, and very responsive. The varnish is a red-brown oil, evenly hand applied. This traditionally crafted instrument has become our most popular instrument for beginners who need full size instruments and many players upgrading from the smaller sizes.